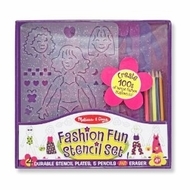 Your little fashion designer will be ready for the runway in New York, Paris or Milan, with this fashionable stencil set. Select a hairstyle and the shape of next season's hot designs, then stencil and decorate! This ooh la la set includes stencils, a rainbow of colored pencils, a pencil sharpener and an eraser.